In the distance, from the left lie Ullock Pike, the bulge of Broad End, Skiddaw, Skiddaw Little Man, Lonscale fell, and Blencathra. Then, in the distance lies Great Mell Fell, and Clough Head is on the right. The darkened peak in the centre is Outerside, which leads to Stile End and Barrow. The path to Braithwaite lies through Barrow Door, between these last two. Keswick is seen in the middle distance beyond Barrow. 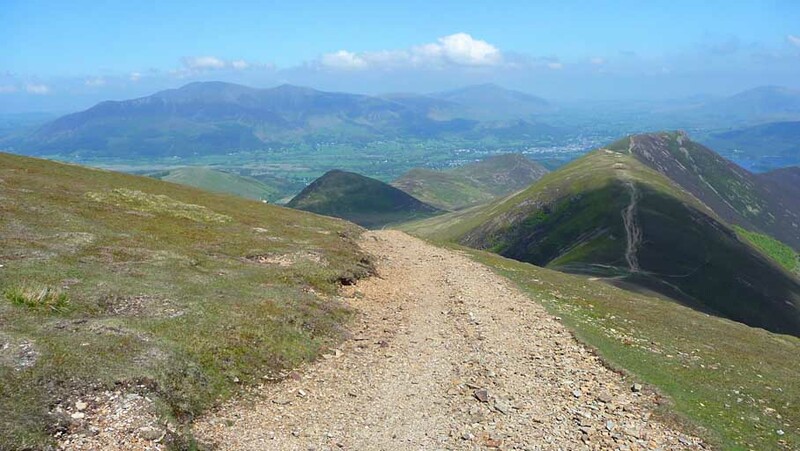 The path in the foreground leads to the col on the right then over Scar Crags to Causey Pike. There is a glimpse of Derwentwater to the right of it. Smaller version of this picture.